Muni, the 11 year old headmaster, teaching children from the slums of Dacca. Already there is a waiting list. Shining through the bad news come two success stories from Bangladesh. The first is the story of Marntaz Uddin, a twenty-five year old ex-Mukti Bahini fighter in the Bangladesh war of independence. Hit in the leg by rifle-fire, Marntaz was unable to get treatment in time and the leg had to be amputated. Soon afterwards, Marntaz started to make himself an artificial leg from bamboo canes. Some months later, Marntaz heard that a new orthopaedic hospital had been opened in Dacca, runt by an English specialist, Dr. Bill Downes. Comfortable on his bamboo leg, Marntaz decided to visit the hospital to see if his experience might be of some use in treating the hundreds of people who had lost limbs in the sear. 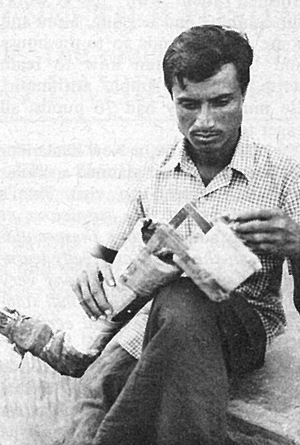 Dr. Downes commented: "Marntaz's leg is as sophisticated as any artificial limb ever made in the West." Marntaz himself says that the bamboo leg, with its articulated knee and ankle joints, is more useful and comfortable than the normal artificial limbs made of metal. Marntaz was recruited on the spot and is now teaching his fellow countrymen how to make limbs for themselves. Also from Dacca comes the story of Mohammad Munir, surely the youngest headmaster in the world. Mohammad, or `Mini' as he is better known, is eleven years old and runs a school for poor children in the Bangladesh capital. Coming from a middle class home, Muni is one of the 18% of the Bangladesh population who can read and write. About three months ago he decided, without any prompting, that the kids in the slums of Dacca were getting a raw deal - they were poor therefore they could not go to school. Therefore they remained illiterate, so they could not get good jobs. So they remained poor. Muni decided to do something about this situation. 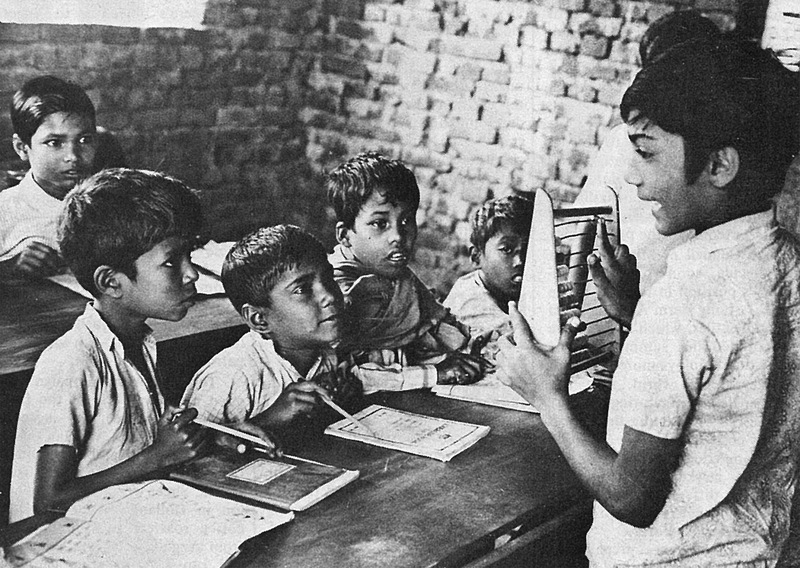 He talked to some of the poor children, and, realizing how much they wanted education, he opened a school in a large and empty house in Dacca. After Muni's own school day is finished, and after his pupils have finished their own day's work, shoe-shining and begging, Muni and some of his friends go to the house and teach children how to read, write, and do simple arithmetic. He immediately had 70 pupils, all eager to learn. Allan Cheyne, a New Zealander in Dacca who had planned a similar venture, decided to visit Muni's school first. "I was suspicious at first" he admits, "but these children from the slums are really learning. They take their lessons very seriously and the educational standard is very good. Muni certainly beat me to it." Muni has addressed a meeting of government officials and United Nations personnel on his plans for the school, and has been given some money to buy basic equipment. The Bangladesh government has officially recognised the school, and already there is a waiting list.